Pyrolysis gas chromatography (Py-GC) allows the analysis of small amounts of polymeric samples in a wide variety of forms including insoluble and composite materials without pretreatments and provides unique information that otherwise cannot be obtained. Py-GC is a very useful and powerful analytical technique for polymer characterization. Using the flash pyrolysis (single-shot technique), a sample is placed in a sample cup and the sample cup (Eco-cup), which is held initially at room temperature. The Eco-cup is then dropped into the pyrolysis furnace, which is held at a precisely set high temperature. A pyrogram is obtained by introducing the resulting pyrolyzates into a GC separation column. A number of improvements have been implemented into the Single-Shot pyrolyzer “PY-3030 S” over the previous model, providing higher quality pyrograms. Reproducibility of polystyrene (PS) pyrograms is guaranteed. 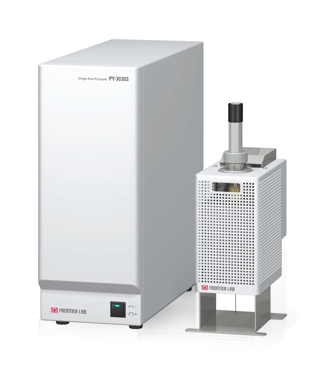 The coefficient of variation (RSD) of peak area ratios of styrene trimer (SSS) and methyl stearate (Me-St) is guaranteed to be less than 2 % with GC/MS. The entire flow path is deactivated. Using five types of samplers including two new samplers (optional), samples in a wide variety of forms can be analyzed. With F-Search library search software using pyrogram and additives libraries, unknown polymeric samples can be rapidly identified.